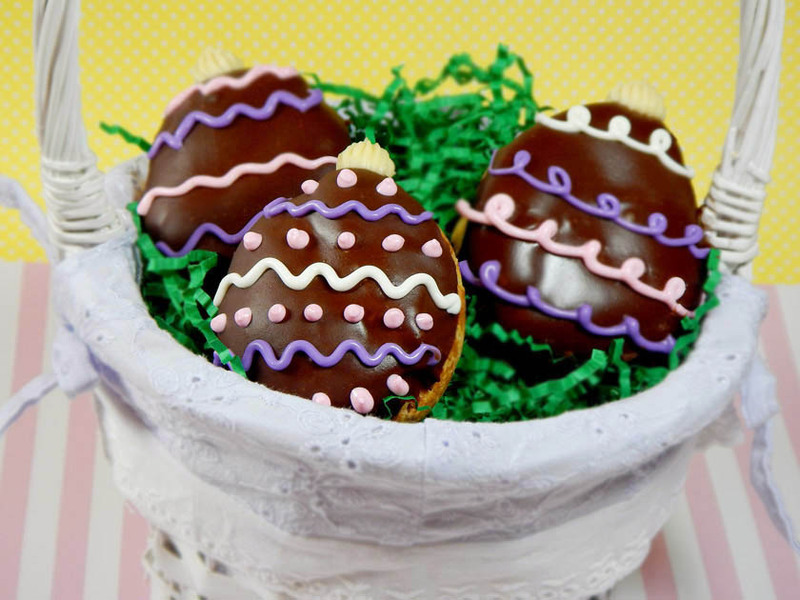 How fun would it be to fill a brunch basket with Easter Egg-clairs? I had to get the bad pun out of the way. Please forgive me. The TV news writer in me simply can’t resist a play on words. Now, back to business. 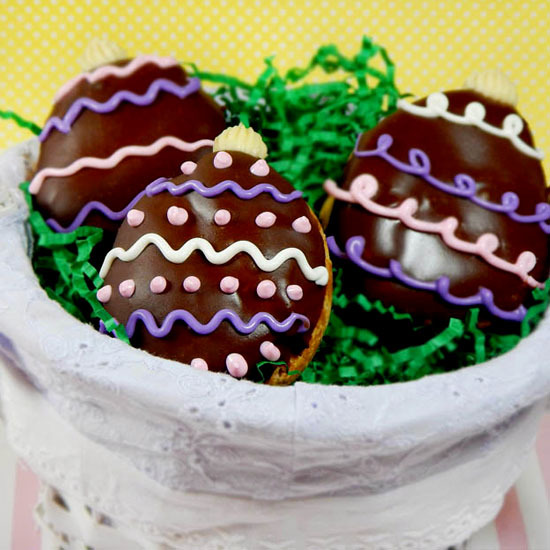 These egg shaped éclairs are an adorable addition to the Easter buffet table and yes you can make them yourself. Your friends and family will be so impressed they will think you went to pastry school. 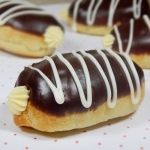 If you have never made éclairs before, you can check out my step-by-step photo tutorial on how to make the shells (pâte à choux), pastry cream, and ganache glaze. I use the same recipe and techniques for the base of traditional éclairs as I do for these Easter Egg Éclairs. The main difference is the piping shape. 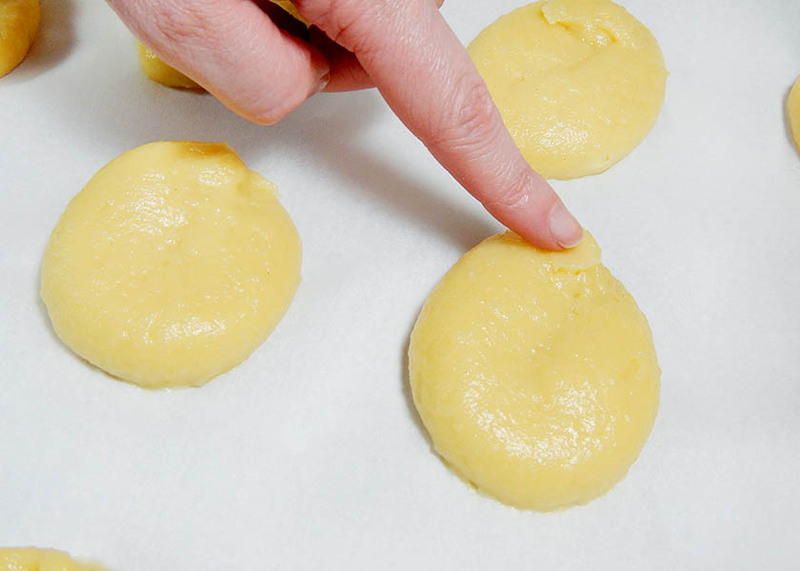 Pipe your dough into egg shapes that are about two-and-a-half to three inches long. Using a pastry bag without a tip works great. Use a wet finger to flatten any points so they don’t burn. Once your éclairs are baked and cooled, dip them in chocolate ganache and let it dry. If you’re going for a pastel palette, you might try a white chocolate ganache glaze. Then it’s time for the most fun part – the decorating. Dye white chocolate with gel paste food coloring or use pre-colored candy melts. Pour the colored chocolate into pastry bags or squeeze bottles. I had great results with Wilton squeeze bottles. 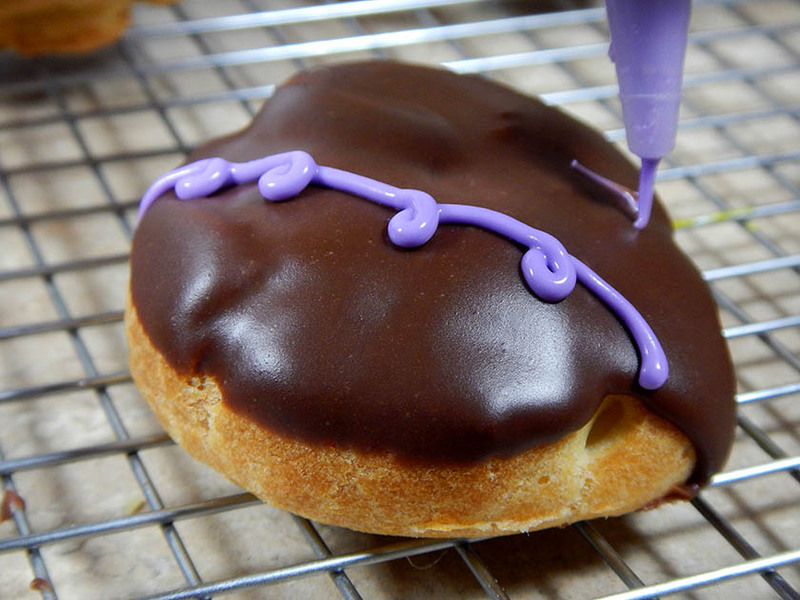 While I like using chocolate because it shines and doesn’t smear, you could also use a colored frosting. 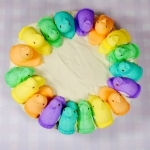 Vanilla Buttercream is a good option. 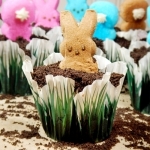 Here’s where your imagination gets to hop down the bunny trail. You can mix and match countless colors and designs. 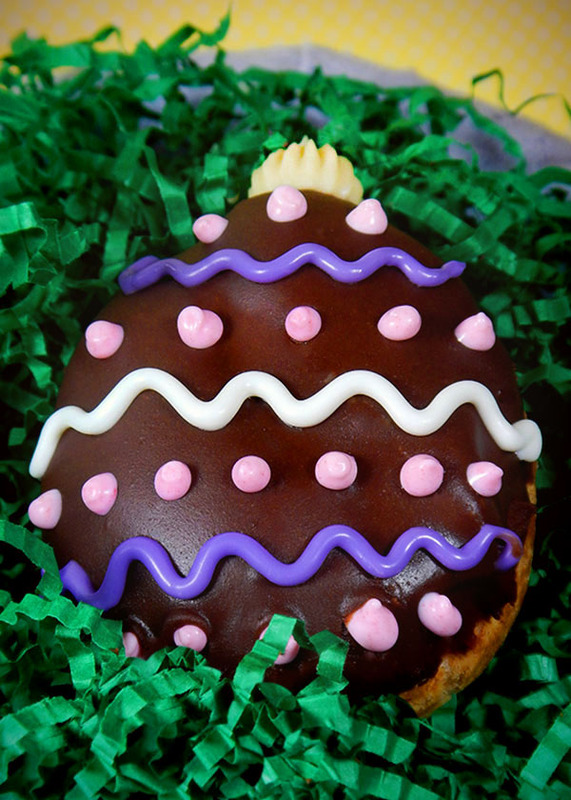 Have some fun with Easter Egg Éclairs that match your party decorations, school colors, or favorite sports teams. 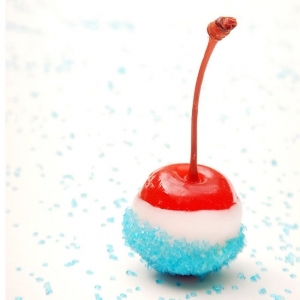 You can play with sprinkles and candy too. Wouldn’t jelly beans be cute? I’d love to see what designs you create. Email a photo to laurie@frostingandasmile.com and I’ll share your creations on my Facebook page. 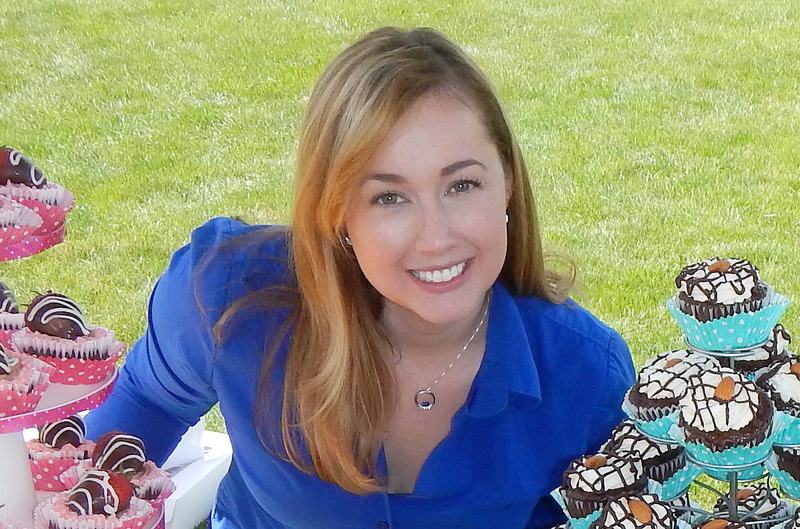 For more delicious recipes and fun kitchen ideas, you can follow me on Facebook, Twitter, or Pinterest. You can also sign up for a free email recipe subscription. I originally created these for Parade. 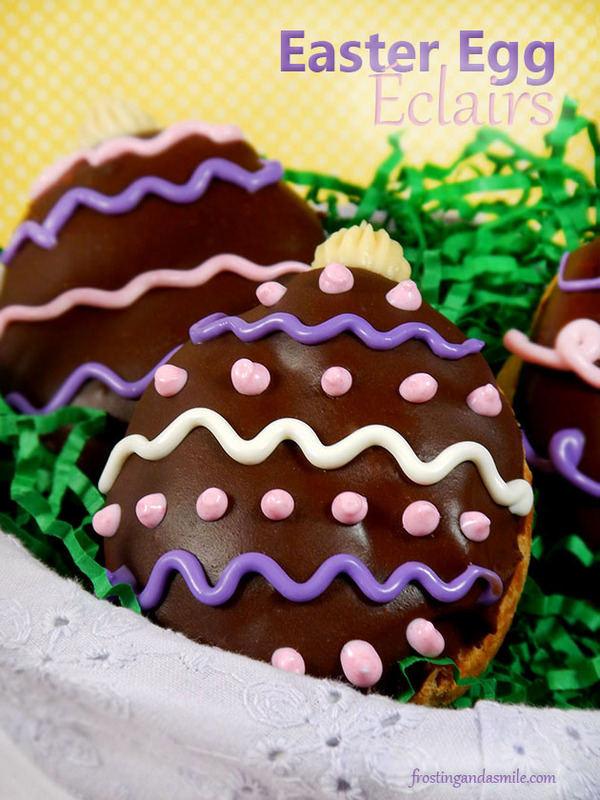 Éclairs shaped like Easter Eggs. 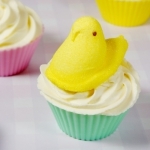 In medium bowl, whisk together egg yolks, cornstarch, ¼ cup sugar, and salt. 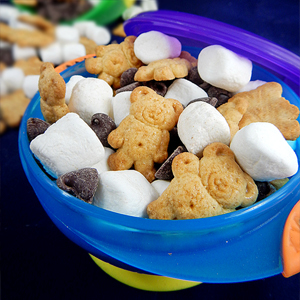 In medium saucepan, combine half and half and ¼ cup sugar. Heat until milk simmers. Slowly whisk hot milk into egg yolk mixture. If you do this too quickly you will cook the eggs. Strain mixture back into saucepan. Stir constantly until mixture bubbles. Strain into a clean bowl. Stir in butter and vanilla. Press plastic wrap onto top of cream and refrigerate until cold, at least two hours. Place chocolate in a medium bowl. In a small saucepan, heat cream over medium heat just until bubbles start to form. Pour hot cream over chocolate. Let sit five minutes. Add vanilla. Stir until smooth. 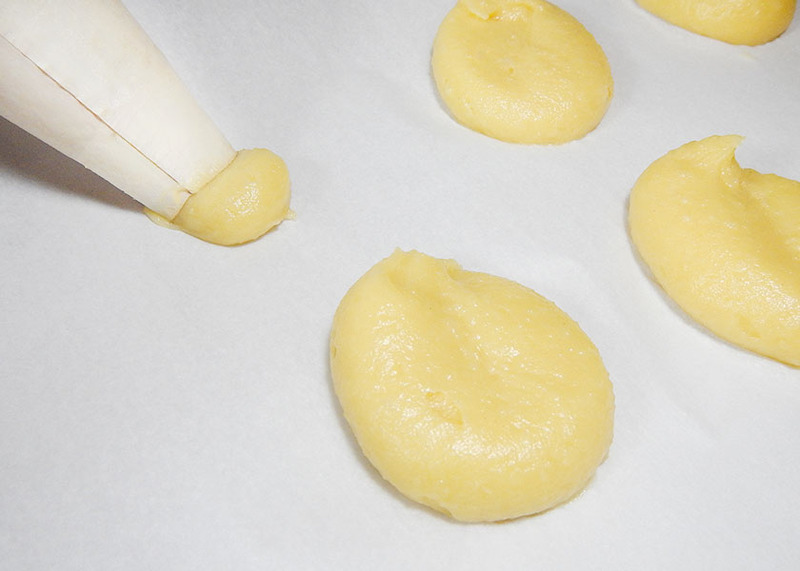 Let cool while you prepare pastry dough. Preheat oven to 425 degrees. In medium saucepan, combine milk, water, butter, and sugar. Cook over medium heat until the mixture simmers. Add flour all at once. Stir until the dough pulls away from the sides of the pan and forms a ball. Remove from heat. Let cool for three minutes. Add vanilla. Add eggs and egg whites one at a time. Thoroughly mix between each addition. 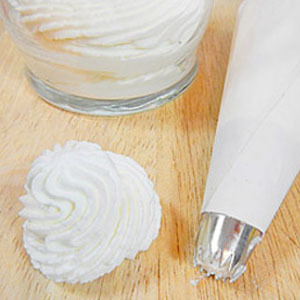 Use a large round tip or a pastry bag without a tip to pipe two to three inch lines onto parchment-covered baking sheets. Bake in 425 degree oven for ten minutes. Decrease heat to 350 degrees. Do not open the oven door. Bake for thirty minutes. Remove pastries from oven. Pierce one end of each shell with a knife to allow steam to escape. Cool. Fill with pastry cream. Dip tops in ganache. Let set. 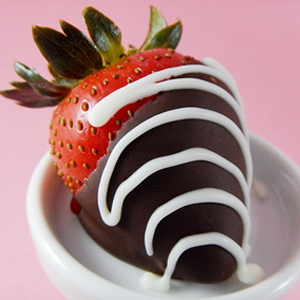 Decorate with melted chocolate. Let chocolate set. Serve. These are best served within a few hours of preparing them. 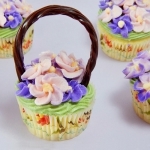 You can store them tightly covered in the refrigerator overnight but they will get somewhat soggy. Would you recommend that the butter be melted, softened, or melted? Sorry for the stupid question. Sorry I didn’t mean to put melted again. I meant cold. ? Hello Destiny, In both the cream and the pastry, the butter will melt as you mix.